I can’t believe EduCon 2.4 ended just a week ago.Â As much as I love this annual event, it can be a very frustrating experience.Â For one thing, it’s only two days* when I would love to be able to spend a week with the people who make the trek to SLA. Then, not only are there too many great discussions scheduled opposite each other during each block, the hallway and lunch conversations (an indispensable part of all conferences these days) are usually truncated far too soon. 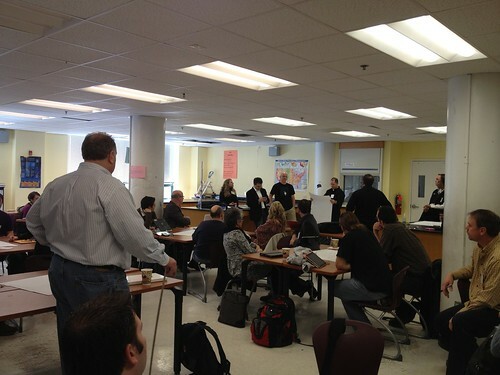 Even so, EduCon packs a lot of valuable ideas, learning, and reflection into a very short time. The high point of my EduCon experience this year was the opportunity to meet and hear fromÂ Dan Barcay, a software engineer in the Google Earth group and a leader in making that software more interactive. Considering how much time I’ve spent working with GE tours, I wish I had more time to pick his brain. I’m sure there’s lots I’m missing. Dan was also part of the Friday night panel at the Franklin Institute where the question was how do you sustain innovation. We hear a lot about the need to teach innovation but if you look at the environments in which the panelists work, it’s more a matter of creating an environment in which people are free to innovate. I was a little frustrated that they didn’t discuss the role failure plays in innovation beyond a very brief part following a question from the audience. Our education system tends to place too much emphasis on the need to get the right answer rather than helping kids understand how to deal with and recover from failure as one school in England is doing (although one week hardly seems like enough time). In addition to innovation, another unstated theme of EduCon centered around the idea that we need to build communities that will advocate for real change. It reminded me of a conversation from two years ago where some of us were frustrated with slow pace at which the talk was being turned into action. The difference in 2012 is that there were lots of communities represented in that weekend at SLA who feel the same way and are doing something about it. Finally, one of the major benefits of traveling to Philly the last weekend in January each year, is the homework I assign myself. The recommended books and articles for my reading list, connecting with new people whose blogs and Twitter feeds I need to follow, the ideas generated that deserve far more research and thought. Ok, so if you take all that into consideration, I guess EduCon lasts a whole lot longer than two days. However, I still would like more time for extended conversations with several dozen of the truly inspirational and smart people in attendance. Is it Labor Day already? That means kids will be returning to their classrooms tomorrow here in the overly-large school district and a new year begins. The date is something of a surprise since the past five weeks have been one big blur for me. August is normally a very busy month for us as we scramble the whole time to help everyone get their schools ready to open. But this year has been particularly hectic for many reasons, not the least of which is a much-higher-than-normal turnover in the ranks of our tech trainers, combined with less money and fewer people to support them. Well, maybe I have one complaint. The fact that I haven’t written much of anything in this space (not to mention on Twitter) in nearly three weeks is a direct result of only having the time and energy to take occasional cursory scans of my RSS, Twitter, and other streams of thought that, in my normal routine, I would be able to sample in more depth. Writing, an activity I’ve come to enjoy (which would certainly surprise my English teachers), requires the time to read, reflect on and connect ideas drawn from that flow. I also missing having the time to join conversations that form around the writing at other people’s blogs or to drop in on the audio discussions that seem to be proliferating online. Anyway, August is over and it’s New Year’s Day. And although I’ve been out of the classroom for a while, I still have a feeling of optimism and new opportunities that always came with the start of a new school year. A chance to do a reset, try some new ideas, and figure out ways to make things a little better than they are now. *ï»¿Getting sick this weekend sure didn’t help either.